The news is full of the Zika virus, which is understandable as we await the outcomes of the potential spread of that virus. I hope that we are able to find a prevention strategy for this virus soon. I do find myself wondering, however, why we spend so much time talking about the Zika virus, which thus far has only impacted a handful of pregnancies in this country, yet our airwaves are silent on the topic of another virus that causes 1 in 750 American children to be born with or develop permanent problems due to the virus. That virus is CMV or Cytomegalovirus. 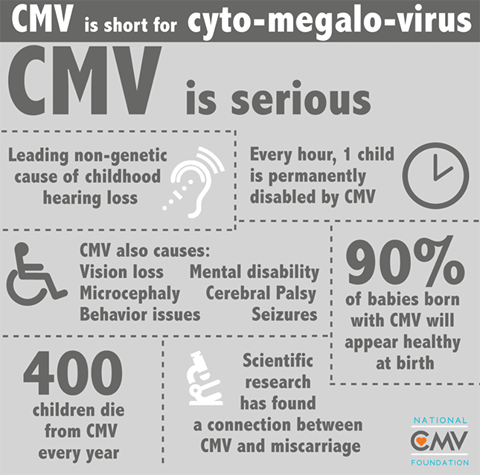 Every hour, one child is permanently disabled by CMV. As a nurse with most of my career spent in obstetrics and pediatrics and also as the mother of three beautiful children, I think that I had begun to imagine that I knew most conditions that could impact a pregnancy and infancy. Currently, as a public health nurse who educates high-risk pregnant clients and mothers of young children, I certainly felt well-informed about pregnancy health. However, the pregnancy of a co-worker -- a nurse herself, made me rethink my knowledge of pregnancy health altogether. Image courtesy of The National CMV Foundation. My co-worker Amanda was in the middle of a planned second pregnancy, with a healthy 2-year-old and a supportive husband at home. At her 20-week ultrasound, however (a turning point for many pregnant mothers at the halfway mark of pregnancy and a time when many learn the gender of their baby) the results of the pregnancy were abnormal with the cerebellum (the part of the brain that coordinates muscle activity) measuring three weeks behind. They were sent to a the perinatologist the next day who performed an amniocintesis. The family endured 10 days of fear in wait of the results, which came back as CMV, also known as Cytomegalovirus. Only 9% of women know about CMV. 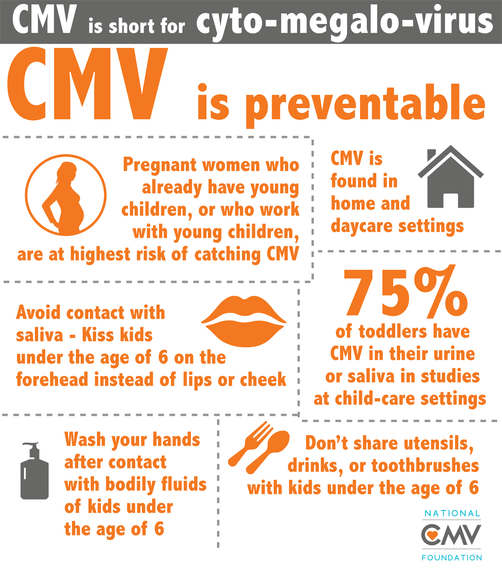 According to the CDC, 1 in 150 children is born with a congenital(present at birth) CMV infection. And yet, it is a virus that many of us have never heard of -- even as Zika rages through our media and has become a diagnosis that most of us are very familiar with. Graphic courtesy of The National CMV Foundation. What Amanda and her family were now facing is a virus that impacts families around the world every day -- a virus that many of us have no knowledge of. Amanda, like me, did not recall ever hearing of the virus other than a vague recollection of a brief education in nursing school years ago. The family now had a printout from the CDC in their hands from the doctor and a world of education about the virus to seek out. They were offered the options of an abortion or they could "wait and see." The doctor reported that there were no treatments of CMV in pregnancy. The impacts of CMV on the infant can range from very mild to severe and there was no guarantee on which end of the spectrum their baby would be. 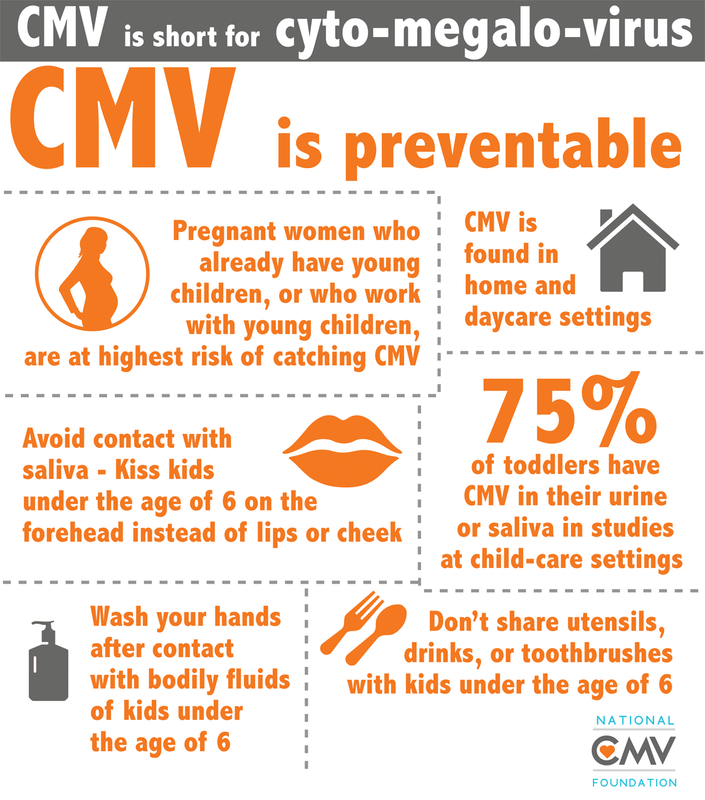 400 children die from CMV every year. The family went home and did their research, discovering that the University of Minnesota offered a treatment during pregnancy with immunoglobulin, something that is done more frequently in Europe and a treatment that their doctor had not been aware of. The cost was over $80,000 US and was covered by insurance. They would do 4 treatments during the pregnancy. After the fourth treatment, Amanda realized that her baby was not moving as much as normal. They did a biophysical profile (a test that measures the health of the fetus during pregnancy) and it was determined that they should deliver her early at 34 weeks. This early birth was not due to CMV but a true knot in her cord (and is a helpful reminder to all expecting mamas in their third trimester to count the kicks). Pippa during her NICU stay. Sweet Pippa was born and she spent three weeks in the NICU due to her early birth. She tested positive for CMV in her blood, urine and saliva at birth and also failed her newborn hearing screening. She began an antiviral treatment (Valcyte) which has been shown to improve hearing and neurodevelopmental outcomes, a treatment which she took for six months and tolerated well. 90% of babies born with CMV will appear healthy at birth. At six months old, her parents noticed that she was not developing typically. Pippa had an MRI and it showed polymicrogyria (a condition characterized by abnormal development of the brain before birth) in the frontal and temporal lobes of the brain. Pippa is now 8 months old. She is just now starting to roll over(a four month-old developmental skill) and she does not make many sounds. Her family take her to physical therapy weekly and occupational therapy every other week. Her life is punctuated by doctor and specialist visits and her parents are told that she will likely have difficulty with speech and language and possibly cognitive issues. She will need physical therapy, occupational therapy, speech therapy and maybe special education. Her future is unknown as issues can arise many years into a child's life. Paul, Amanda, Atticus and Pippa today. I asked Amanda what her family wanted people to know about CMV. She wants everyone to know that it is common, preventable and treatable. OB doctors in this country are not routinely educating soon-to-be parents about the disease but everyone has a right to know how to prevent transmission of the virus during pregnancy. CMV is more common than all of the newborn screening disorders COMBINED. Yes, combined. And, yet we still are not having a conversation about this virus that has an impact on so many on a daily basis. They also want other families that are dealing with the complications of CMV to know that they are not alone. During her tough moments, Amanda often goes to the Facebook page of the National CMV Foundation to read the stories of other beautiful children like Pippa and their families that rally around them each day. She also hopes that families dealing with a new CMV diagnosis would see if the antiviral therapy that was right for Pippa may be right for their child as well. Today Pippa is a happy baby that brings joy to her family every day. Her family sometimes wonders what life may have been like for Pippa if they had known about CMV before the pregnancy and were able to prevent the consequences of this virus. They also are often reminded that Pippa could have been one of the 400 that die each year from CMV and this fact makes them hold her a little closer in gratitude that she is here. If you are considering becoming pregnant or are currently pregnant, we ask that you go to the National CMV Foundation for more information and to start a conversation with your OB about CMV prevention. You can be tested for CMV prior to pregnancy and can take steps during pregnancy to prevent transmission(most likely from a young child) to you and the baby. My hope and the hope of Pippa's family is that we will someday have a world where this common,preventable and treatable virus is no longer negatively impacting pregnancies and children. That dream can only happen when we begin to talk about CMV and ensure that every family has the information that they need to prevent the detrimental impact of this virus. Together, we can make that happen. This article was originally published on The Zen RN.